For the navy’s most senior enlisted man it was a seminal moment. It was — in today’s terms — the most ordinary of scenes, but the fact it was taking place in a mess aboard the frigate HMCS Charlottetown was extraordinary. Chief Petty Officer 1st Class Michel Vigneault was amazed to see a sailor having a Facetime conversation with family back home on a smartphone. The moment neatly captured the conundrum he and the top brass have faced in making the navy, which has for a decade been perpetually short of sailors, an appealing place to work. The moment encapsulated two issues: the longstanding prohibition on Wi-Fi coverage aboard warships and the amount of time sailors are away from home. Both have become central to the retention and recruiting makeover that is underway as part of the Liberal government’s recently introduced defence strategy. The ban on Wi-Fi was an obvious irritant. The navy has dropped what its top sailor called the “draconian” policy on the technology and has embarked on a program to install Wi-Fi on each of its warships. The U.S. navy began installing 4G LTE networks aboard its ships in 2012, while Canadians sailors have over the same period of time been forced to stow their cellphones while at sea — particularly when in secured areas — and rely on the occasional satellite phone conversation with family at home. Those infrequent chats conducted through “morale phones” were largely dependant on the warship’s jammed-up operational network. 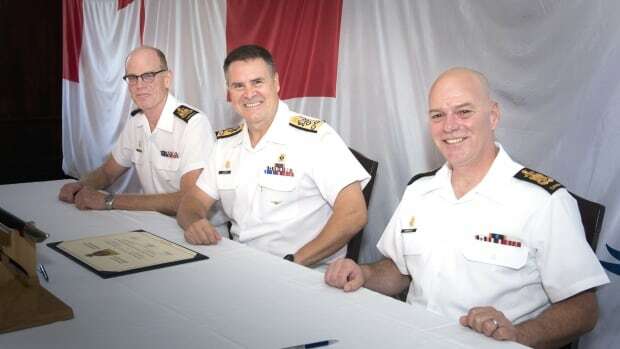 Lloyd said last summer the crew of HMCS Toronto bought a Wi-Fi kit and installed it for use in non-secure locations aboard the ship, demonstrating it could be done expeditiously. The coastal patrol ship HMCS Summerside had done the same, according to a navy publication. The Wi-Fi works while a warship is in port — home or otherwise — and Lloyd said they are working on creating access while the ship is at sea, in much the same manner airlines now offer connectivity for passengers in the air. Aside from obvious security issues, which the navy insists it has a handle on, the introduction of Wi-Fi brings with it questions about privacy, social media addiction and, potentially, policing of content. Many of those issues are covered by the military’s overall social media policy, but until recently they were not matters individual ship commanders had to routinely consider. Getting the quality of work-life balance right has also forced the navy to revisit and revise long-standing deployment policies. The shortage of sailors has meant an increase in what is known as “attached postings,” which has seen crew members do back-to-back deployments at sea for months on end. Lloyd says they are now measuring, down to the sailor, how many attached postings there are. “There is nothing worse than going from ship to ship,” he said. A flag officer — namely a fleet admiral or task force commander — will now have to sign off on deploying a sailor for more than 180 days per year. And ideally, Lloyd said, the navy is trying to avoid sending someone to sea for that length of time years in a row. It is a sea change for an institution that, for decades, gauged its effectiveness not by how long individual sailors were away but by the numbers of days its individual ships spent on the ocean. Just how far out of step the navy has been with the rest of society was underlined when senior brass met recently with pollsters to discuss, among other things, getting millennials interested in a career at sea. Lloyd said the research found the navy was — in some instances — going in precisely the opposite direction to the expectations of the next generation.